Amps: OK…first thing. From out of nowhere on this new record Colored Sands comes “The Battle of Chamdo” which I loved. What inspired that? Luc: Well the plan was to break the record in two halves. Instrumentally I wanted to take distortion, drums, and all the technical metal orchestration out of the listener’s ear, because if you listen to pounding drums and guitar for over an hour at some point it saturates the ears. This brings different colors and also this piece is very important to the concept of the record in a sense that Chamdo is the place where Tibet lost the war against China, lost their independence. Everything happened there. The song has a different personality. Amps: I am brand new to GORGUTS, so all I know of you is what I’ve read. Tell me something about you that I CAN”T find online in this age of Wikipedia and google. Luc: Hmmm, a lot of sites have talked about the band, what can I say (laughs)? There’s a lot of information on all the records. On the first two records we were more of a typical death metal band, and I think the reason for that is because in art you learn by imitation. You know, walking, talking, drawing, speaking…so if you take it to the craft of writing death metal songs those two records, I like them but I think the real identity of the band started with Obscura. That’s where we found our own language, our own identity and personality, aesthetic-wise. We consciously wanted to get rid of all the death metal instrumental clichés, and I don’t like that word. I mean, painting can have its own clichés, but a paint stroke is a paint stroke. We just wanted to get rid of what we did on the first two records: fast picking, SLAYER-beat drumming, etc. Of course we kept the guttural vocals but we worked on finding a new language on the stringed instrument more. Even the drumming is not typical. Our attitude was “Let’s do everything we don’t know.” By forcing ourselves out of our comfort zone we came up with a new way to write. And I think Colored Sands is an extension of that new language found on Obscura. Amps: Looking forward to this run which starts in March? You’re playing here in Dallas on the 21st, third show of the tour, and I will be there! My first GORGUTS show! Luc: (Laughs) Oh, totally! It’s been awhile. We did a short east coast tour just before Christmas, but we haven’t played in Texas or anywhere in the South for a long time, over 10 years. It will be great to play shows with some new music. There’s nothing wrong with the old material but now it’s time to play some new stuff. We always had great crowds in Texas; they’ve always been so great to us so it will be good to play there again. Amps: That’s because the metalheads here are insane! (Luc laughs) The new record was very well received last year. The new guys, were they like an injection of new life? How was the writing and recording process? Luc: Oh, totally. They are great artists. They’re super-creative, amazing players and performers. So when I decided to have each of them in the band it was totally because of their talent. It was very stimulating for me to have new players because I would write a new song here in Canada and send each of them an mp3 of the song from start to finish with a click track. Next thing I knew a couple weeks later I would get the song back and Colin (Marston, bass) would have all his bass tracks written and Kevin (Hufnagel, guitar) did the same on guitar. John (Longstreth, drums, since departed at press time) and I shared the writing of those parts and sometimes he’d throw something at me that I never would have thought of so they were a big part of the sound of the record. It’s important to me that everybody leaves his fingerprint and personality on the writing. We kept 99% of everything, you know? And it was written very spontaneously. Amps: Believe it or not, I’ve really been enjoying Colored Sands while I’m at work. I find it oddly soothing, is that weird? Luc: Well, I think it’s a record that has, compared to previous ones we did, the songs are longer and more transparent-sounding. It’s more flowing from an instrumental listening point of view. I can totally understand what you mean. I see the whole record as a whole story with each song a chapter. Everything connects well together and it flows. Maybe that’s the calming aspect. 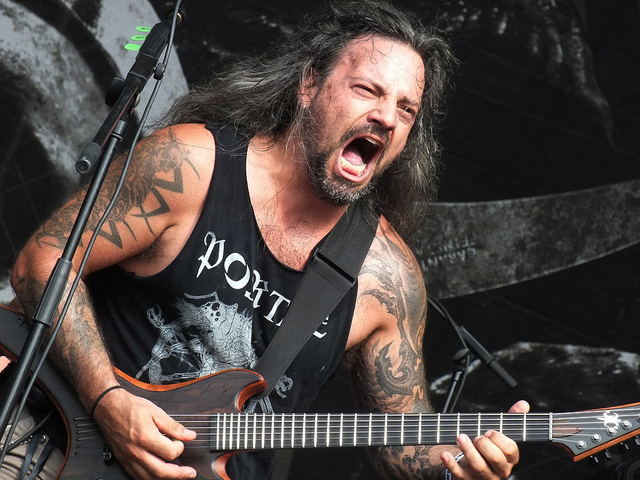 Amps: What’s next for GORGUTS? What’s the plan for next few years? Luc: Play as many shows as we can. Go out and share the music live with the fans as much as we can and then write more music. Amps: OK, so you’ll give us more music. That’s what I wanted to hear. Luc: Oh yeah, definitely new music for sure. I’m in a very, very happy spot right now, for sure. Amps: What do you like to do to unwind away from music? Luc: You know, if I don’t have to write music, I’m not gonna. Other than that I enjoy woodworking, I like working with my hands. For the past 10 years I’ve done a lot of carving and building custom furniture. But now I kind of put that on the side because the band is taking more of my time. And I want to get back to writing some classical music. This I miss a lot, it’s what I would do if I wasn’t writing metal music. I just got myself an old piano and I have to get the old guy tuned. I’m looking forward to writing more classical music when I’m not on tour for the next year or so. Amps: What’s in your CD player/iPod now? Luc: Oh, all kinds of stuff. I listen to a lot of metal, but I’ve been buying a lot of metal records since spring of 2013 and lately I didn’t know what to listen to. Slowly I’ve been going back to solo piano music and been listening to some Claude Debussy pieces. 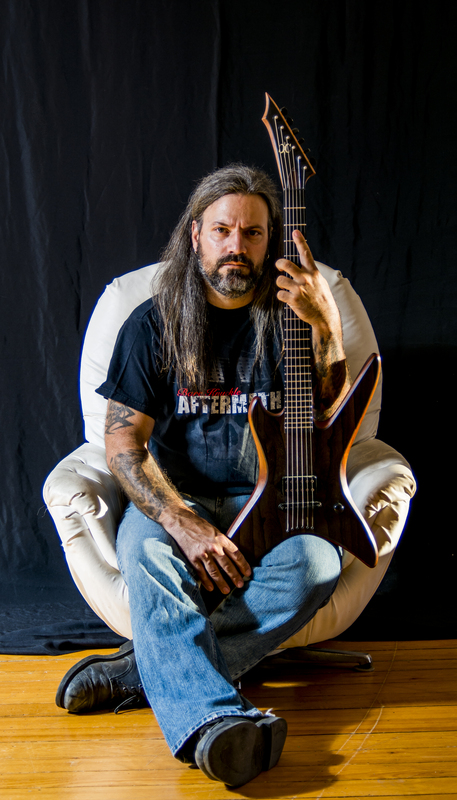 Amps: Do you have anything you’d like to say to the GORGUTS fans? Luc: First, that I can’t wait to play in Texas again! I have many friends there and I love the landscape there. For all the U.S. tours I could never wait to get to Texas. People are nice and they love their metal. And I’m looking forward to getting back out to see all our friends in the States! Like I said, Luc Lemay is one interesting guy. Be sure and pick up Colored Sands if you haven’t already, and catch the DECIBEL MAGAZINE TOUR (see dates HERE) featuring GORGUTS, CARCASS, THE BLACK DAHLIA MURDER, and NOISEM in a city near you!